Which subject do you teach? All Latin classes at THS: Latin 7th Grade through the advanced electives. B.A. Classics, U. of Colorado, Boulder. M.A. Italian, CAL, Berkeley. M.A. Latin and Greek, San Francisco State U. Ph.D. Classics, Florida State University. My doctorate specialized in Roman Archaeology. For eight summers I excavated Roman villas and an Etruscan hilltop settlement. Above all, I am an Italophile, and my love for Italy fuels my academic interests. In my dissertation I investigated ancient navigation and was able to combine two of my key interests: Italy and sailing. I am particularly interested in the intersection of ancient Roman technology and religion, which was a significant element in Roman navigational technology. 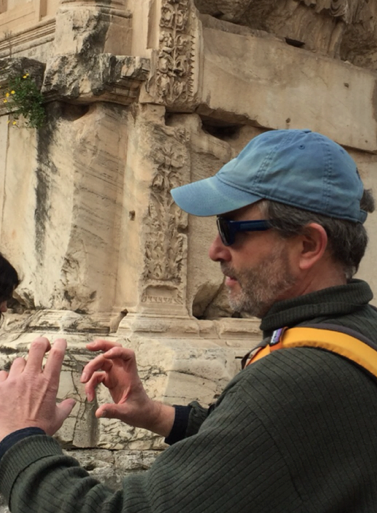 I am more familiar with Rome than any other city in the world, and I enjoy sharing my knowledge and passion for the city with Tower Hill students. I look forward to our next trip during Spring Break of 2018. I love being around children and young adults. Their energy and enthusiasm make me feel young! One of my career goals is to keep classical antiquity alive for future generations. Many elements of our lives have their origins in Greek and Roman culture, and I like to help my students understand the continuities and differences between the ancient and modern worlds. I am also passionate about words and etymology. In fact, my Latin 2 class is investigating not only the Latin origins of English but even the etymology of Latin itself. I like hiking and sailing. I am an avid reader of just about every genre, although I enjoy history the most. For the last few summers I have been studying the rock art of the American Southwest. I am able to use my classical archaeological background to compare the symbols that appear both in New World and classical art.